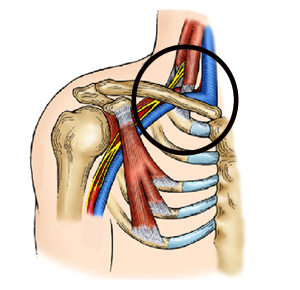 Venous thoracic outlet syndrome occurs when the vein, shown in blue, passing between the collarbone and first rib, is compressed and damaged, leading to blockage of the vein. Surgeons at Washington University School of Medicine in St. Louis have identified tiny fractures and other rib abnormalities in patients treated for a circulatory condition called venous thoracic outlet syndrome. Also known as subclavian vein effort thrombosis or Paget-Schroetter syndrome, the disorder is often seen in elite athletes who rely on their upper extremities. The hallmark of the syndrome is blockage of the vein that carries blood from the arm to the heart. The vein passes over the first rib and under the collarbone, making it vulnerable to compression, especially under repetitive stress with the arm in an elevated position. In these patients’ first ribs, located under the collarbone, the abnormalities Thompson and his colleagues reported include unusual calcification, degeneration of the rib and even small fractures that cannot be detected by X-ray studies. The study is available online in the Journal of Vascular Surgery. In one year, 37 patients underwent surgery at Barnes-Jewish Hospital to treat venous thoracic outlet syndrome. Thompson found that 16 of the patients had previously undetected fractures in the first rib (43 percent). And of those patients over age 30, 76 percent had rib fractures (16 of 21 patients). Thompson says that the relatively unique surgical method he uses to treat the venous condition makes Washington University one of the only places in the country where these rib observations could have been made. 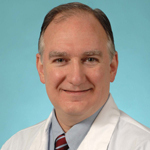 According to Thompson, treating this relatively uncommon condition in high volume — with patient referrals from across the country — has allowed Washington University surgeons to make new observations about what may be causing it. Sheng GG, Duwayri YM, Emery VB, Wittenberg AM, Moriarty CT, Thompson RW. Costochondral calcification, osteophytic degeneration, and occult first rib fractures in patients with venous thoracic outlet syndrome. Journal of Vascular Surgery. Online Feb. 10, 2012. This work was supported by a grant from the Thoracic Outlet Syndrome Research Fund of the Barnes-Jewish Hospital Foundation.